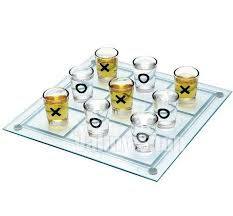 Cups X and O glasses are a fast game and offer a great opportunity for players to concentrate and dissipate their attention and thought. It resembles a lot with, other types of games only as a name but as the content is different because it involves another activity. Think, hit, and target. All this in 9 glasses of water x and 0. Do not miss the chance to be the one who will try and stay impressed with this game. It is necessary to prepare a room or a leveled ground. The tables that are being played should be protected by a film so that more water is poured out. On the three tables where the game will take place, it is necessary to arrange it at the same distance. The distance is good to be between tables at 50 cm. Prepare 9 glasses of 200 grams filled with water in three parallel lines both vertically and horizontally. Step 1. Two players from different teams are chosen. Everybody gets about 10 table tennis balls, next to him in a bowl. Two players from different teams are chosen. Everybody gets about 10 table tennis balls, next to him in a bowl. Step 2: Choose 3 tables. It is preferable to be of the same size. Step 3: Place 9 glasses filled with water on the middle table. On these glasses, they have to cushion the tennis balls. Step 4: It is also marked as a cone or other observable object at a distance of 50 cm. From this mark the player will throw the tennis balls. ‍Step 5: The players at the start, both of them trying to hit the table in front of them with the tennis ball in such a way that they reach a certain glass on the middle table. Step 6: Dropping a jumble until a player manages to complete 3 glasses. They can be diagonal, vertically or horizontally. The one who completes the first is the winner. To win this game, it is necessary to take into account more. First of all, keep the optimum distance when throwing tennis balls on the table to get into the glasses. It is also good to feel the blows in order not to give the target rate. If your opponent has hit any glass try to block it and also search for empty glasses to fill them with your own color balls. Much success!